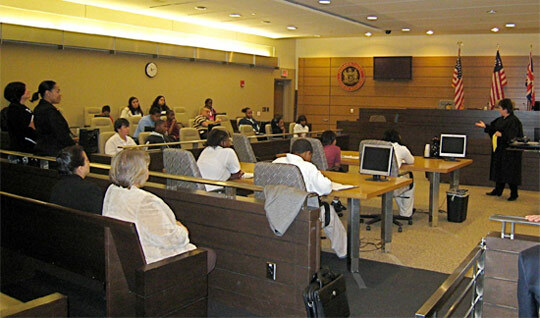 Twenty-five students from Bayard Middle School in Wilmington recently spent the morning in the New Castle County Courthouse attending a Youth Forum to learn more about the court system and careers in the law. The sixth through eighth grade students started their visit with a tour of the courthouse and an introduction to the new technologies used in the courtroom. Members of the Judiciary, along with representatives of the Attorney General’s Office and the Office of the Public Defender participated in a discussion with the students about their jobs and what it took to become a lawyer and judge. “You have the power to do whatever you want in life if you are willing to work hard” was the message sent by the speakers, many of whom discussed their own paths in becoming attorneys. “Know what you want and stick with it. Don’t let others get you on the wrong path” several speakers emphasized. Students also had an opportunity to get more of a taste of the legal profession as they participated in a mock trial as a prosecutor, defense attorney, witness, judge or juror. The morning was “awesome” according to numerous comments by the students. The Youth Forum was sponsored by the Delaware Supreme Court and staffed by the Administrative Office of the Courts as part of its racial and ethnic fairness initiative which is co-chaired by Justice Henry duPont Ridgely of the Supreme Court and Chief Judge Alex J. Smalls of the Court of Common Pleas. Another effort undertaken as part of this initiative has been staff training on diversity issues. Six sessions throughout the state for court employees emphasizing how cultural differences can affect the perception of court system fairness were conducted by Ed Justinianno of Amigo Consulting and additional training is being planned. In addition, the racial and ethnic fairness initiative sponsored a presentation at the annual Judicial Conference held in September 2008, including Wayne McKenzie of the Vera Institute and John T. Chisholm, District Attorney for Milwaukee, discussing racial justice issues.